Love science? Love savings? Sign up! Is anything better than free? How about an instant coupon for $5 OFF your next order over $50? As a subscriber, you'll be the first to receive updates on our latest products, special "insider" sales events, and our favorite teaching tips for instilling a love of science into even the most reluctant learners. Plus, you'll get our official "Super! Wow! Neat!" 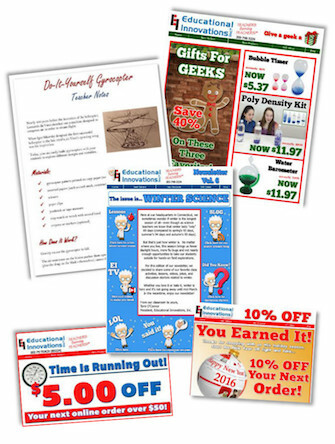 newsletter with lesson ideas, classroom activities, blogs & more. Enter your e-mail address below and look in your inbox for your coupon!